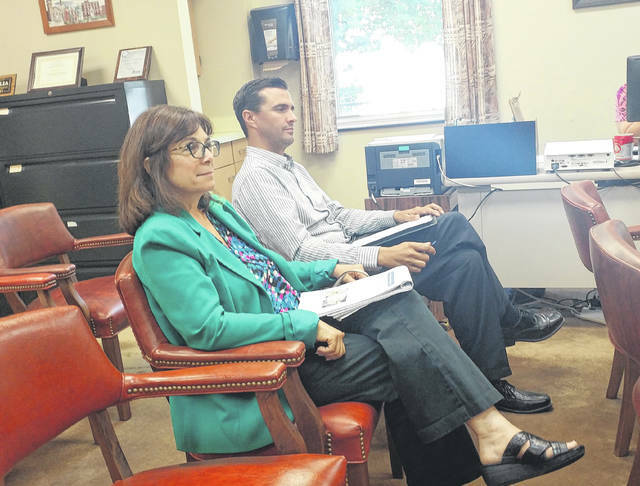 Gallia Engineer Brett Boothe and Gallia Deputy Engineer Beth Lozier speak with Gallia Commissioners Thursday regarding the possibility of applying for grants to finish paving Gallia roads and creating a smart corridor. GALLIPOLIS — Gallia County may soon be looking at a future where stone and dirt roads become part of an information highway. Gallia Commissioners approved grant application proposals from Gallia Engineer Brett Boothe Thursday in the Gallia Courthouse aimed at gathering funding to pave the rest of Gallia’s gravel and dirt county roads and to potentially turn parts of US 35, and a few other roads, into a “smart” corridor. Boothe said the application process for a pair of federal grants he aims to bring to Gallia are “pretty intense.” The engineer aims to make use of federal BUILD program funds. He said he has had favorable conversations with the Ohio Department of Transportation and area internet service companies looking at potential partnerships in infrastructure development, pending grant approval. Boothe’s smart truck center, ideally, would have electric charging stations. Boothe feels these areas provide for “innovative public and private” partnership opportunities to install electric charging stations for over-the-road trucks and passenger vehicles and for the installation of fiber optics along area roads. The engineer said this could improve the “high-tech industrial development and trucking industry expansion” of the region. The project is estimated to cost around $29 million to complete. The second grant Boothe seeks to attain would allow for the paving of 130 miles of county stone and dirt roads. The engineer believes this would improve economic development in the area as well as emergency response times. Such a project is estimated to cost around $27 million to complete. According to Boothe, he is allowed to apply for up to $25 million in grant funds for each project, totaling around a possible $50 million to be brought to Gallia’s economy, should the funding be approved. Boothe proposes to put up one half million to two million dollars of local money in matching funds per projects as, he says, it would allow project proposals to score higher for approval. Commissioners approved Boothe’s proposal, although they had questions as to the current state and future of self-driving vehicles. Commissioner Harold Montgomery said he was interested in seeing whether township roads could also be paved with said funding.